Great Britain once used the Broad Arrow symbol, either stenciled or sewn onto clothing, to mark a person as a convicted criminal. 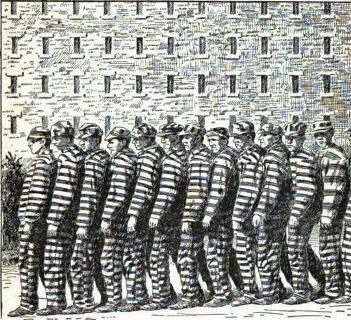 Here in the United States, stripes were the usual mark of a convict. Either way the uniforms were decorated – arrows or stripes – they instantly shouted ‘prisoner’ to anyone that saw them. So how does this relate to last week’s block in the Grandmother’s Choice quilt project? In Great Britain, as here in the US, many suffragettes were willing to risk imprisonment to draw attention to the movement. Once released from the prisons or workhouses, the members of the Women’s Social and Political Union turned the Broad Arrow into a badge of distinction, proudly wearing replicas of their uniforms in public displays to draw even more attention to the fight for women’s rights. In other words, I’m going to make a sharp left turn away from reality and let you have another peek at the way my brain works. Whenever I ponder prison stripes – and I don’t really ponder them too often, but when I do – my thoughts often wander over to memories of Krazy Kat, a comic strip created by George Herriman, that ran as a daily from 1913-1944. Ahem… that was before my time, but my thanks go out to the many devotees who kept the strip alive until I could stumble across it. The strip took place in Coconino County, Arizona, and the storyline revolved around a love triangle between Krazy Kat, a mindlessly happy creature who absolutely adored one Ignatz Mouse, and Offissa Pupp.. who was patently ignored. Ignatz absolutely despised the naively curious Krazy Kat, and the one joy in his life was to “Krease that Kat’s bean with a brick.” Krazy Kat always misinterpreted the brick bombings as a sign of Ignatz’ love. Of course the strip had many other wonderful characters that popped up here and there: Mrs. Kwakk Wakk and Bum Bill Bee, Don Kiyote (an aristocratic coyote) and Walter Cephus Austrige, just to name a few. But I know what you’re thinking… how much fun could it be reading about a perpetual victim of abuse where everyone uses an idiomatic vocabulary? Lots. You always knew how the strip was going to end – love always finds a way – and the joy, as in many things, is in the journey. This entry was posted in Grandmother's Choice and tagged Cartoons, Krazy Kat, quilting on March 31, 2013 by Jo.